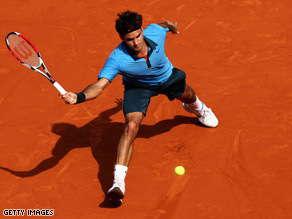 Roger Federer has exclusively told CNN he feels he could beat reigning champion Rafael Nadal at this year's French Open in Paris, because despite winning four tournaments in a row the Spaniard is "only human." The world number two, who is hoping to avenge three consecutive defeats in the final at the hands of Nadal at Roland Garros, hopes this year will prove a turning point. "He's won four straight times here in Paris which shows how tough he is, but if you play him the right way there's chances, he is only human and we wait for that moment when he is not at his best and hopefully that will be this year," the Swiss said. The 27-year-old certainly started the right way if he is to mount a succesful challenge, beating Alberto Martin 6-4 6-3 6-2 in under two hours to advance to the second round to set up a clash with either Jose Acasuso or Santiago Ventura. Federer's win is another positive result to add to the good form that saw him complete his first victory over Nadal in almost two years in taking the Madrid Open title. "I feel good, that's most important, I'm confident and feel like I can beat the best and win again. "I had a good Australian Open and I came through some back problems, so I feel like I'm playing better and moving better." Federer added. Meanwhile, world number one and top seed Nadal, started his record fifth defense of the French Open title in similar imperious fashion, beating Brazilian qualifier Marcos Daniel 7-5, 6-4, 6-3. Though the defending champion was forced to work for his win, having to battle from behind against the 30-year-old Daniel in the first two sets. One of two Russians, Igor Kunitsyn or Teimuraz Gabashvili, await Nadal in the second round for the 22-year-old. Despite hoping to emerge as victor at the event, Federer lavished praise on the man who had a 33-match unbeaten run on clay before losing to the Swiss in Madrid. "I think (Nadal's) biggest strenthg is his movement on clay, he's by far the best, day-in-day out he never lets go and mentally he's become very strong . He's been able to adapt and against the best he's never gone five sets. That's impressive."